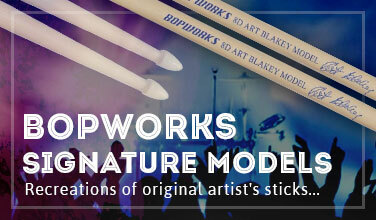 Located in Austin Texas, Bopworks Drumsticks was formed to create genuine, faithful replications of the designs that produced a sound and feel not possible with those found in the modern market. Our sticks are custom made in the USA from American Hickory with vintage machinery similar to that used to make the original drumsticks in the 50's - 70's. 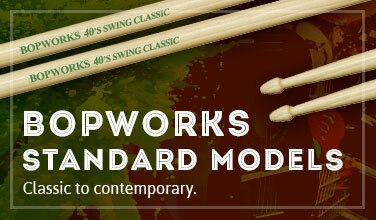 Bopworks features 7 models, starting from the 60's style "Birdland" to the backbeat friendly "Rhythm & Groovz . For the "old school" aficionados, we offer Mel Lewis and Art Blakey signature drumsticks. 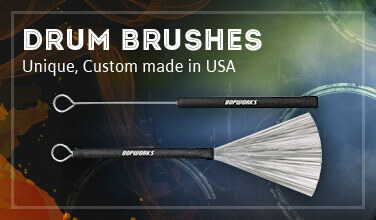 Brush players love the Bopworks "Spread-Lok" brushes that lock at 2" or 4" spreads. The Spread-loks" feature traditional thinner gauge wire for a smoother sound.